In a foreboding castle somewhere in central Europe, a strange fear has descended upon the inhabitants. One morning the body of a young girl was found, as pale as a sheet of paper and totally drained of blood. Vampires are on the prowl! Who is the monster who murders innocent during the night? Before the truth will be discovered, more than one person may face unjust accusations thrown out by the devious servants of darkness. Will the Hunters successfully catch the Vampires before they endanger the entire society, or will the castle and city fall forever into darkness? 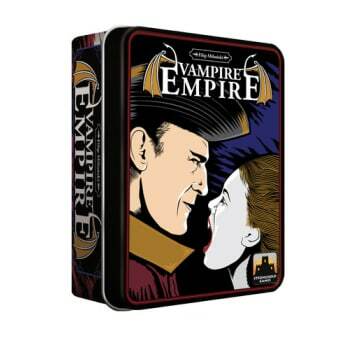 In Vampire Empire, three characters in the castle are Vampires. A human Hunter is trying to determine which three of nine characters he encounters are, in fact, monsters hiding in human form so that he can eliminate them. The Vampire, on the other hand, must bluff cleverly, present confusing clues, and trick the Hunter into attacking innocent citizens. By doing this, the Vampire can kill the most important characters in the city or conquer the castle.